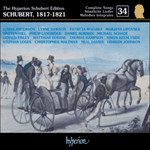 Schubert’s occasional music in honour of special people in his life, including dedications of works to friends and so on (one thinks of the touching little song written for the departing Schober, and the comic letter to Josef von Spaun in Linz) could be the subject of a small treatise. The composer was a man who paid his dues, and he was not slow to honour and thank those who had been good to him. The most substantial works composed specifically in honour of individuals are in cantata form, a type of musical homage reserved for father-figures. The first of these, naturally enough, was for the father himself: Franz Theodor Schubert’s name day in October 1813 was celebrated with Zur Namensfeier meines Vater (D80) for two tenors, bass and guitar accompaniment (with a text by Schubert himself). Next, a work which honoured Schubert’s composition teacher: the Beitrag zur fünfzigjährigen Jubelfeier D407 was written in 1816 for the fiftieth anniversary of Antonio Salieri’s arrival in Vienna. 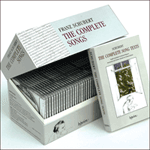 Again Schubert was the poet of the occasional text. Later in the same year Schubert composed a cantata for soloists, chorus and orchestra entitled Prometheus (D451) with a text by Philipp Dräxler von Carin. Admittedly this was a commission (the composer’s first), but it honoured the name day of Heinrich Josef Watterroth, a professor at the University of Vienna of liberal views who was held in much esteem by the Schubertians. Sadly this work has long been lost. Still later in 1816 there was another orchestral cantata (D472) in honour of Joseph Spendou, an important man in the Austrian school system who was the patron and supporter of Schubert père, and a longstanding friend of the Schubert family. Johann Michael Vogl was the last ‘father figure’ to be honoured with a cantata. In 1817 Schubert had won the singer’s interest in his songs. Although he was at first distant and grand, not immediately convinced of Schubert’s importance, Vogl very soon became a total devotee and spent more and more time with the composer. Continual and ever closer musical contact led to an invitation for Schubert to spend the summer of 1819 in Steyr, Upper Austria, a town some ninety miles west of Vienna. The cantata for Vogl was written during this holiday to celebrate the singer’s fifty-first birthday. (Vogl liked to return to Steyr in the summers; it was his home town, as it was, incidentally, of Johann Mayrhofer and Albert Stadler, poet of the cantata.) In introducing the composer to his circle, Vogl created an instant network of new Schubertians. Thus we hear a number of names for the first time which will continue to weave their way through the biography: the Schellmanns – Albert père et fils; Josef and Josefine Koller, father and daughter – the Namenstaglied was written for Josef in 1829, and Josefine was the dedicatee of the Piano Sonata D664, composed during the same holiday, or perhaps on a later visit in 1825; the well-to-do Silvester Paumgartner, later to be the host of Vogl and Schubert during their Steyr visits in 1823 and 1825 and the man for whom the Forellenquintett (D667) was composed. Like Graz later in Schubert’s career, Steyr became a centre of interest in the composer’s music, and a place where he felt he could return, confident of a warm and affectionate reception. It is sad that his second visit in 1823 was blighted by his illness. The 1825 holiday, the first-ever lieder tour, was the high point of Schubert’s friendship with Vogl, and Steyr was the axis of the roving itinerary. Here Schubert was able to recapture some of the happy feelings of his first visit. Josef and Josefine Koller were the hosts on the evening of this work’s first performance, and Josefine (sometimes called Josefa) herself sang the soprano part. The middle line was taken by Bernhard Benedict, a local tenor. These two shared the extended solo passages in the cantata, and it is notable that the bass line sings only in the ensembles. This is because Schubert had fashioned this part for himself. Whether or not he sang as he accompanied is a contested point. One witness claims that this was so, but Deutsch tells us categorically that, on this occasion, Albert Stadler played the piano. The work is divided into three main movements. The first of these is in C major and begins very much in the ceremonial manner of a Mozart opera overture. Pomposo dotted chords in the bass (forte) are echoed in the treble (piano). After four bars an elegant little solo tune emerges, as if written for clarinet; this descends, and then re-ascends the stave and leads to an interrupted cadence which in turn takes us back to C major. Conventional stuff this, but superbly crafted in impeccable classical style, which would here seem very much to the singer’s taste. These opening eight bars are repeated and now serve as accompaniment to the first two lines of text which address the singer in a manner which charmingly combines the breadth and grandeur due to a famous personage with a certain intimate affection. After this, where the sound of songs is compared to rainfall, the piano writing quickens; the glinting and plashing of these semiquavers, both hands in the treble clef (at ‘fällt’s wie sanfter Regen nieder’) could have come from a Mozart piano concerto. The idea of something being sent from heaven (‘den der Herr vom Himmel schickt’) occasions a piano trill suggestive of a small bolt of divine lightning. Various elaborations and repetitions of these first strophe words extend the movement. The word ‘erquickt’ (refresh) gives rise to a charming four-bar interlude for the piano in gently wafting quavers, as if to suggest relaxed satiation. The repeat of ‘Sänger, der von Herzen singet’ occasions a quasi-canonic imitation between the voices as if to imply a resonance echoing outward and spreading through the world. The second movement (marked Allegretto) is in F major, and duple time changes to triple. This is the soprano solo and in gentle pastoral style, ideal for a salute to the singer’s beginnings in the homeland mountainous region of Steyr. There is just a hint of an Alpine yodel in ‘diese Berge sah’n dich blühen, hier begann dein Herz zu glühen’ (and also at the repeat of the words later in the movement). One of Vogl’s friends who was at this performance recalled many years later that the singer seemed to be especially moved at this passage. All of this music is written in an unashamedly old-fashioned manner, almost demure in its effect, although there are more romantic expressive touches (the chromatic darkening of ‘glühen’), and the majestic extended cadence of ‘der Wahrheit Krone tragen’. When the tenor takes over (the poem’s third strophe), and as Vogl gets into his professional stride in this song-biography, the music changes from something gently reflective to something that suggests hard work and activity. This is the only rather awkward passage in the piece as melodic invention cedes to a sort of narrative arioso. A lot of information has to be imparted, and some of it needs explanation to the modern listener: ‘Da saht ihr Oresten scheiden’ refers to Vogl’s assumption of the role of Orest in Glucks’s Iphigénie en Tauride (the section is introduced by ominous pacing quavers with a left hand plunging towards the bottom of the keyboard – music appropriate for this restless and tragic character); ‘Jakob mit der Last der Leiden’ to the role of Jakob in Méhul’s Joseph: ‘Saht des Arztes Hoffnung tagen’ to the role of the regimental doctor in Adalbert Gyrowetz’s Der Augenarzt; ‘Menschlichkeit in Wasserwagen’ to the role of Micheli in Cherubini’s Deux journées (in German Der Wasserträger). ‘Saht, wie man sich Lienen sucht / Bräute holt aus Bergesschlucht’ is more obscure: Emeline (or Liene) is a character in Josef Weigl’s Die Schweizerfamilie where Vogl played the role of her suitor Jakob Friburg. The soprano returns for the fourth strophe and, as the poem emerges from its biographical phase and begins a reflection on the singer’s fame, the accompaniment changes to suggest the celebration of something grand and sacred. It is exactly this rhythmic cell (minim + dotted quaver-semiquaver) which opens Lied eines Schiffers an die Dioskuren, so it is no surprise to see that there is a classical reference in this verse – Thalia was one of the Graces whose name is associated with festivity. Over this rhythm the vocal line continues in arioso mood – something between the dryness of recitative and the melodic flowering of melody. The tenor takes over for the fifth strophe with a veiled hint. Although Vogl was to retire fully only in 1822 (and an appearance in Schubert’s opera Die Zwillingsbrüder lay ahead of him) there is reference here to a new phase in life – something which must have been talked about for some time in Vienna where it was generally felt that his powers were on the wane, at least as an opera singer. Leave the heroes to someone else (although what artist wants to be told this?) says the poet. If you have to stop playing the role of Orestes (‘Agamemnons Sohn’) you will still retain his great heart. The whole of this passage was probably inserted because Vogl planned to live in Steyr at his retirement, and his friends looked forward to his return there. This was never to be; the singer unexpectedly married in 1826 and from then on his links with his former circle were considerably weakened. The third section returns to the common time, as well as the C major, of the opening. This is a typical Schubertian peroration, often to be found in the partsongs, in that it employs a canon by way of musical envoy. This is justified in the text by the use of the phrase ‘spiegel klar’ – ‘crystal clear’ in translation, but literally ‘mirror-clear’. This music is is not just the suggestion of a canon, but the real thing – an eight-bar phrase heard first in the soprano line, then tenor, then bass. On the bass’s entry the soprano is given a charming discant as if an instrumental obligato; this emphasises the ‘heiter’, or happy and carefree, nature of the envisaged retirement. The accompaniment to this section has begun in rather solemn fashion in quavers, but these turn to more liquid right-hand triplets, and by the time all three voices are singing together we have a party atmosphere with dance-like triplets between the hands. The revels are interrupted by the inevitable spectre of mortality (‘schweigt dann einst des Sängers Wort’) which is announced by a Neapolitan shift from C to A flat major. At this point one is reminded of how lucky we are in our own century that a great singer’s art will never be lost to us, resounding on shellac, vinyl or plastic across the centuries. Schubert’s contemporaries were never to know this fact, but Stadler hits upon the idea of a resounding soul (‘tönet doch die Seele fort’). Is it not this very thing that does remain in the disembodied recorded tones we hear of the great artists no longer with us? We remember a great singer of the past not as a corporeal presence, but precisely because something belonging to that individual alone, call it a soul if you will (and it is easier for a voice to take on a spiritual quality when not allied to a visible body) remains resounding in the ether. This idea is beautifully caught by Schubert’s closing music where cleverly layered repetitions of the words conjoin (as if gathering their expressive resources) in the final six bars. These last few bars are high in tessitura for all three singers, and the music seems to trail off into infinity. It is as if sound waves were being gently beamed into the unknown future – especially for us, perhaps. When this piece was first published in 1849, Vogl was little more than a forgotten singer; his reputation as central to the Schubert story had not yet assured his worldwide fame. Accordingly, new words to do with a spring morning were added by the firm of Diabelli. In 1980 I had the idea to make a more appropriate replacement. For a Songmakers’ Almanac concert for the Aldeburgh Festival in June of that year (to celebrate the seventieth birthday of the great tenor Peter Pears – in twentieth-century song history a Vogl to Benjamin Britten’s Schubert), I commissioned Eric Crozier, the famous librettist of various Britten operas, to write a new text to this music. This he did with great success, tracing Pears’s career with his various operatic roles, and speaking of his retirement and his new tasks as a teacher at the Britten-Pears school in Snape. Fortunately the opening salutation ‘Peter’ fitted ‘Sänger’ perfectly. Crozier’s solution for the rhythms of ‘Der Natur hast du entwandt / Was die Kunst noch nicht verstand’ was an ingenious phrase showing that Pears’s rise to fame took place at the same time as the success of Britten’s first opera: Peter Grimes and Peter Pears shared synonymous careers. Saht des Arztes Hoffnung tagen. Bräute holt aus Berges Schlucht. to refresh the parched fields. what Art has not yet understood. and taking brides from mountain gorges. is not the artist’s reward. will you not travel to your homeland? take only the faithful heart. then his soul will still sound forth.